OK, you KNOW I am NOT the poster boy for cleaning. I do lots of maintenance, but little cleaning. When I saw this I thought, “No more scrubbing until I go crazy.” Turn it on, ZAP, brushed. A) Heat – will not burn up in a jet engine. This is not a grease, it’s an oil. Needle oiler provided for precision application. Yields roughly 50,000 rounds. Glock owners, this is the one. All other guns benefit too. Gun Butter’s Trigger and Locking Lug Grease is a new technology reducing the moment of inertia in moving parts and protection of high impact surfaces. It will out perform conventional graphite and molly greases and offers many times the adhesion.” Trigger Butter” was used exclusively for years in competition by our team. Now blessed by our professional shooters, Gun Butter’s Trigger and Locking Lug Grease, is now available for the first time to all shooters of any level concerned with protection and performance. Also suggested for use on the hammer strut contact point with the cup for the hammer spring. Use sparingly. Note: We do not recommend use on slides surfaces, as the performance of Gun Butter alone is optimal. This brush is one of the most versatile gun cleaning tools I've seen This one brush can be used to clean double-stack pistol magazines, AR magazines, AR Upper Receivers and 12 GA break action shotgun chambers! 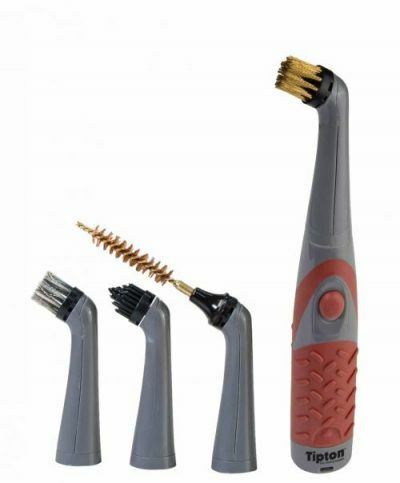 — Nylon Bristles won't take on a set like bronze bristle brushes. 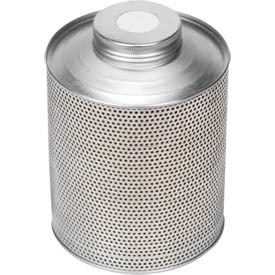 — Can be Used Dry or Wet with your favorite gun cleaning solvent. 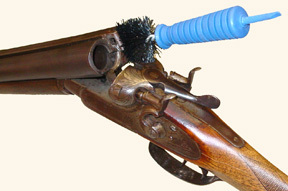 — Nylon Bristles are Compatible with all types of Gun Cleaning Solvents. Perfect for cleaning double-stack pistol magazines. Just disassemble the magazine and run the brush through the magazine tube a couple of times to clean out all the dust, dirt, grit and powder residues. The handle has a convenient base pad removal tool that makes magazine disassembly easy. Just the right size to clean your AR Upper Receiver. 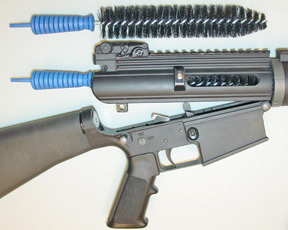 The 8" long brush reaches all the way through the Upper Receiver and into the Barrel Extension. You can even wrap a rag around it for final cleaning. Works on both AR15 and AR10 rifles! Great for cleaning AR magazines. Just disassemble the magazine and run the brush through the magazine tube a couple of times to clean out all the dust, dirt, grit and powder residues. Works on both AR15 and AR10 mags. To clean those ultra long 5/40rd mags, just clean from both ends. Just push in, twist and pull out, and your shotgun chamber and forcing cone are clean! The Nylon bristles are stiff but springy and won't take on a set like bronze bristle chamber brushes can. The 1.5" diameter brush places plenty of bristle force against the bore to thoroughly clean even extreme overbored barrels. The brush is 8" long so cleans both the chamber and forcing cone with a single action. For Break Action shotguns only. 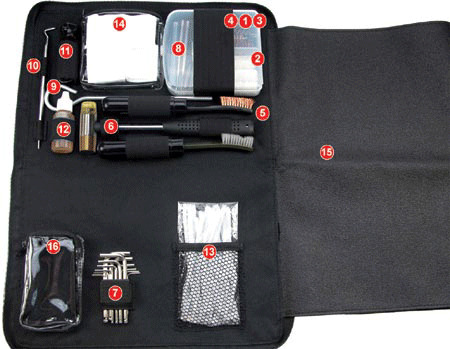 The FIRST EVER cleaning kit truly custom-made for IPSC / IDPA shooters! Designed to fit comfortably into your range bag, the Range Ready Cleaning Kit opens to reveal a rubberized 36x43cm cleaning mat built right into the kit itself. 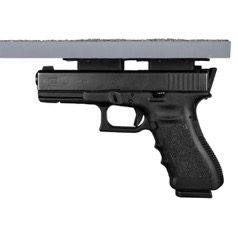 The mat, made of durable PVC material, is the perfect workstation for your field repairs and pistol cleaning needs. The non-slip surface prevents parts from getting lost and is easy to wipe clean after use. When finished, simply fold and zipper close. The entire Cleaning Kit measures only 8" x 12" x 1.5"(20x30x3.5cm) and easily stores away inside your CED Range Bag or Shooters Back Pack. The Range Ready Cleaning Kit comes packed with custom features and tools. Included are all the brushes and swabs needed for proper gun care, two utility brushes with storage cases, a custom two-head brass / nylon hammer, a custom hex key set in both metric and standard sizes, a 4-bit custom screwdriver set, a plastic storage case for storing brushes & parts, a custom steel punch set, a stainless steel double-head cleaning tool for tough to reach areas, cleaning rod with steel patch loop tip, cotton cleaning patches, wired extractor/firing pin cleaning strips, & a 0.5 oz bottle of the famous Shooter’s Choice FP-10 Elite lubricant, all designed specifically to fit into our compact, convenient and very functional cleaning kit. The CED/DAA Range Ready Cleaning Kit is the only pistol cleaning kit you will ever need again. At $110.00 when purchased separately, the Range Ready Cleaning Kit is an exceptional value! 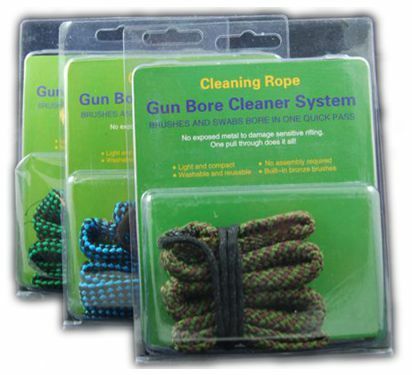 Simply the fastest and most convenient way to clean your gun barrel, be it a pistol, a rifle or a shotgun. Simply drop the weighted end down the barrel, from breach to muzzle and pull through. Do so with or without solvent, as best suites your needs. One pull runs a copper bristle brush as well as a wide long swab down the length of your barrel. You do not even have to disassemble the firearm to clean! 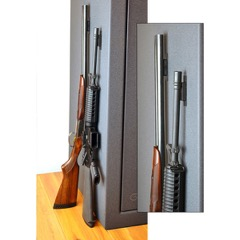 Can be complete in seconds, and your barrel will be ready for another session on the range or in the field. Available in pistol calibers .38/9mm, .40/10mm, .45. 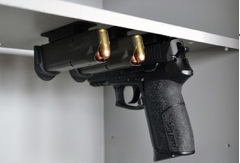 Handgun Hangers provide an innovative way to store pistols by utilizing the wasted space underneath the shelf. Clear off shelf space and make room for more ammo, important documents, etc. With Handgun Hangers, guns are easier to access and make a nice presentation. 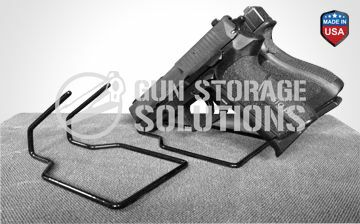 Designed and made by Gun Storage Solutions. 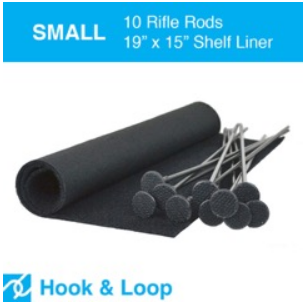 For guns with an overall length of 10" or shorter. Fits on shelves 5/8" - 1" thick. *Allow room for length of gun and ensure door will shut when using this product. Shelf must be at least 10.5" deep to use this product. 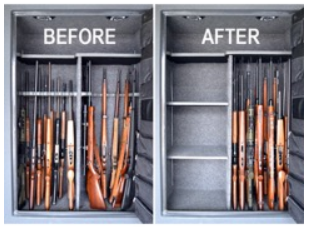 These pistol racks will double up gun storage without taking up the whole shelf. Duelies are both space saving and create easy access to guns. Vinyl coated, these durable duelies fit .22 calibre and larger. Adjust for different sized guns by bending prong up or down as necessary. 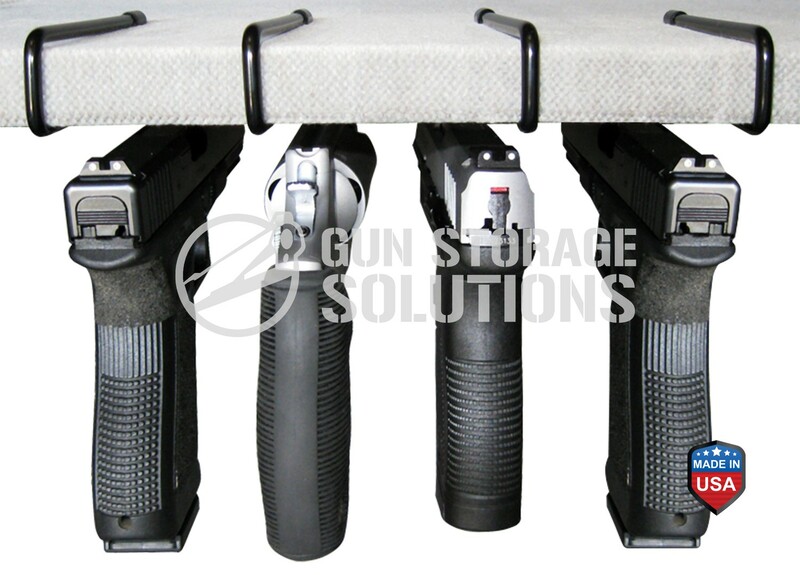 This infinitely adjustable storage system allows you to condense long guns into a fraction of the space yet access them easier than ever. 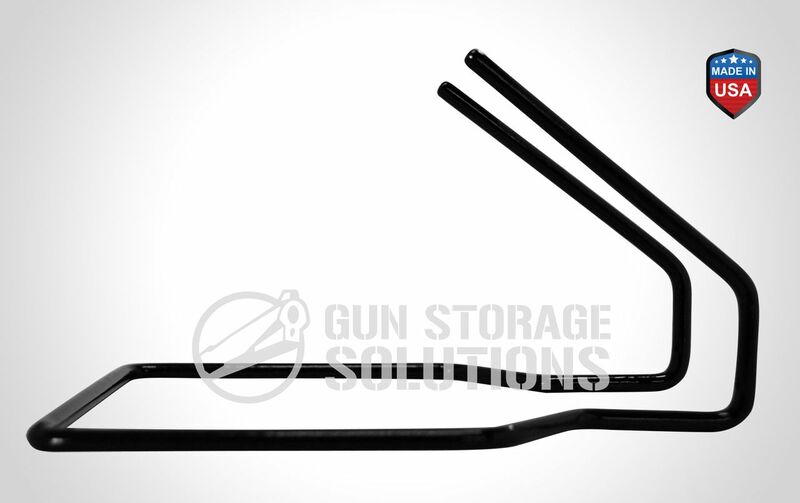 Use our patented storage system to retrofit gun safes, cabinets, etc. Increase capacity as much as 100%. Save yourself from buying a bigger safe. Made in the USA. Lockdown Silica absorbs moisture from the air inside a vault or storage area preventing condensation, mildew and rust from damaging valuable firearms. Crystals change color once fully saturated and can be easily recharged in the oven. I just received the package and I must admit, I'm very impressed! Not just with the lightning fast delivery but with the quality of the products I purchased. Thank you very much. (C) Murray Gardner 2002-2019. All rights reserved.